Here's how marketers can extend the reach of TV campaigns and drive engagement through social. In 2015, 114.4 million people watched the Super Bowl, making it the most watched event in US television history. Many joined conversations about the game on social media, the new proverbial “water cooler.” There were 28 million tweets and 65 million users generated 265 million posts, comments, and likes on Facebook. In a recent study, 79 percent of U.S. internet users say watching ads during the Super Bowl is part of the experience, and marketers can extend the reach of TV campaigns and drive engagement through social. Most game-related posts (87 percent) are via mobile so there’s a huge opportunity for brands to reach second-screeners. The most successful Super Bowl advertisers build a cross-channel social strategy, and Facebook and Twitter should be your core focus throughout the game since most conversations occur on these platforms. Leverage key moments to drive real-time engagement with your target audience. 1. Focus ad delivery on native mobile units to ensure your content is in-view with over 80% screen share-of-voice. 2. Facebook-commissioned research by Nielsen shows that boosting TV campaigns with Facebook video ads drives incremental reach, increases efficiency, and improves effectiveness. Reach users on mobile with native video by using Nielsen’s target rating point (TRP) buying across Facebook and Instagram in addition to TV. 3. If you’re planning a marketing campaign without television as a key channel, utilize Facebook’s audience reach to drive awareness with native video. 4. If you want to showcase short-form video in particular, try Instagram’s continuously-looping video ad unit. Ensure all your visuals on Instagram, including static images, are high-quality. 5. The Super Bowl attracts a wide variety of audiences, so make your creative strategy speaks to your core demographic. Personalize creative and focus targeting segments to boost engagement. Leverage seasonal targeting such as the ‘Football on Facebook’ audience, Datalogix’s show segments, and Pinterest’s Super Bowl search terms. On Pinterest in particular, there are about 7 million Pins and 5 million boards tied to the Big Game, with an uptick in game day related pinning occurring just after the holidays. Brands can create Pins—which live forever—that show how snacks and party ideas for the Super Bowl are translatable to other games and major events. There’s often a pickup in these types of Pins in the days afterwards. 6. For Twitter specifically, join the live chatter by targeting conversations using keywords. Ensure you’re targeting game hashtags and providing users with relevant content to spark interactions your brand. Twitter’s Amplify products give advertisers the opportunity to place their brand at the center of the Super Bowl action by allowing them to add pre-roll video to organic video content from key publishers. You can also use Twitter’s event targeting to drill down into the Big Game’s audience last year—for instance, gender, device breakdown, reach—and the most engaging Tweets. 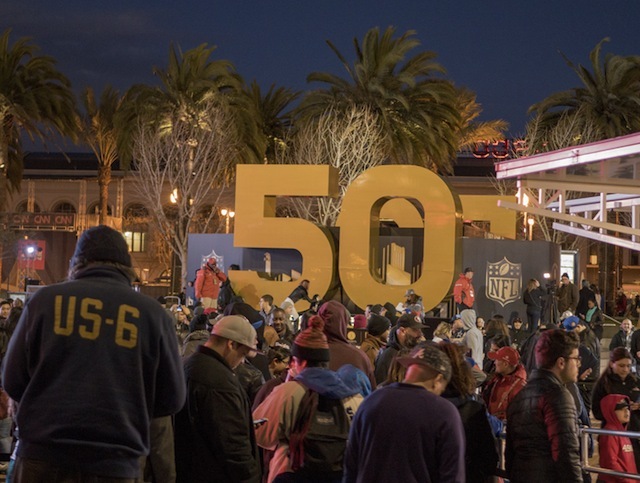 Once you have insights about your event audience, activate targeting for your Super Bowl 50 advertising campaign. Ruth Arber is the director of solutions at Adaptly. Image courtesy of vincenzo mancuso / Shutterstock.com.